Please do not link directly to the full PDF version from your web site or blog because the url will change periodically. Conservation Biology for All provides cutting-edge but basic conservation science to a global readership. 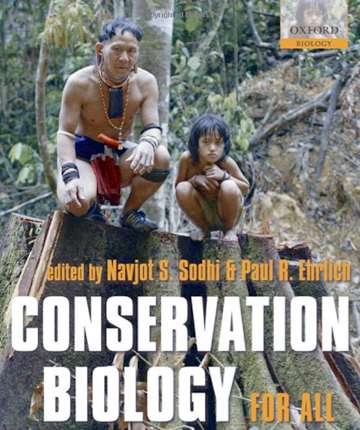 A series of authoritative chapters have been written by the top names in conservation biology with the principal aim of disseminating cutting-edge conservation knowledge as widely as possible. Important topics such as balancing conversion and human needs, climate change, conservation planning, designing and analyzing conservation research, ecosystem services, endangered species management, extinctions, fire, habitat loss, and invasive species are covered. Numerous text boxes describing additional relevant material or case studies are also included. The global biodiversity crisis is now unstoppable; what can be saved in the developing world will require an educated constituency in both the developing and developed world. Habitat loss is particularly acute in developing countries, which is of special concern because it tends to be these locations where the greatest species diversity and richest centers of endemism are to be found. Sadly, developing world conservation scientists have found it difficult to access an authoritative textbook, which is particularly ironic since it is these countries where the potential benefits of knowledge application are greatest. There is now an urgent need to educate the next generation of scientists in developing countries, so that they are in a better position to protect their natural resources. Navjot S. Sodhi is currently a Professor of Conservation Ecology at the National University of Singapore. He received his Ph.D. from the University of Saskatchewan (Canada). He has been studying the effects of rain forest loss and degradation on Southeast Asian fauna and flora for over 13 years. He has published over 100 scientific papers in international and regional scientific journals such as Nature, Science, Trends in Ecology and Evolution, Annual Review of Ecology, Conservation Biology, Biological Conservation, and Biodiversity and Conservation. He has written/edited several books/monographs such as Tropical Conservation Biology (2007, Blackwell). He has also spent time at Harvard University as a Bullard Fellow (2001-02) and Hardy Fellow (2008-09) where he now holds an adjunct position. He currently (or has been) is an Associate Editor/Editor of prestigious journals such as Conservation Biology, Biological Conservation, Animal Conservation, the Auk and Biotropica. Paul R. Ehrlich is Bing Professor of Population Studies and professor of biology at Stanford University and a Fellow of the Beijer Institute of Ecological Economics. His research has ranged from the evolution of DDT resistance in fruit flies, the theory of systematics, the dynamics of butterfly populations, and the behavior of birds and reef fishes to the conservation of mammal populations and human cultural evolution. He is co-founder of the field of coevolution. He is the author or co-author of over 40 books, and some 1000 scientific papers and articles. Ehrlich is a member of the National Academy of Sciences, a fellow of the American Academy of Arts and Sciences and the American Philosophical Society, and past president of the American Institute of Biological Sciences, and a recipient of numerous international honors, including the Crafoord Prize (given by the Royal Swedish Academy as an explicit equivalent of a Nobel in fields where the Nobel is not given) and a MacArthur "genius award". The authors published Conservation Biology for All in a free and open access format in an effort to make conservation knowledge available to as many people as possible. See the box on the right to freely download chapters, or the entire text, of the book.